Discover how our LED panel lights can transform your space. Designed to provide uniform light distribution and bright illumination, our ceiling panels feature an outstanding luminous efficacy achieved by utilizing ultra-bright SMD LEDs, offer visual comfort with high quality light-guide plate. More elegant and modern than any other type of LED panel lights in regards to shape. The sleek design gives a streamlined look to any room with a modern and organized look. Designed for indoor use to provide top-notch lighting with minimal power consumption. Eastar LED ceiling panels provide super bright light by edge-lighting with highly efficient SMD5630, SMD3014, SMD2835 chips from top brands like Cree, Samsung, Epistar, LumenMax, Nichia, and Osram. The high quality light-guide plate (Mitsubishi LGP) as well as energy efficient and ultra compact design enables the panel lighting fixtures to maintain consistent color and a reduced drop in lumens. We use LOOGOD, MOSO, MEAN WELL external constant-current driver, with power factor over 0.95. LED (Light Emitting Diodes) panel lights are very sought-after these days, given the fact that they are not only thin and custom sizable, but very energy-efficient and eco-friendly at the same time, thus being the perfect choice for large areas that require efficient and homogenous illumination. These panels have a unique light distribution pattern for maximum efficiency and reduced energy consumption, thus providing bright and even illumination whenever needed. These features coupled with the long lifespan and the lightweight characteristics make LED panel lights a very common choice for environments that require constant, strong and affordable illumination that cannot be achieved with traditional fluorescent back-lighting systems. LED panels basically consist of small LED bulbs or surface mounted diode (SMD) chips that are embedded in panels that are usually made from acrylic material, polymethyl methacrylate (PMMA) or polycarbonate (PC), for optimal and uniform illumination. These bulbs come in different shapes and sizes and they also have various illumination levels. Affordable, efficient and long-lasting, these lights can provide up to 100,000 hours of efficient and uniform lighting with very little lumen depreciation throughout the years. On average, the panels can last between 50,000 and 70,000 hours, or up to 5 years of continuous usage. If used properly, these panels can be used for a prolonged period of time and still be as efficient as they were whey they were bought. Another benefit is that these panels are usually designed in such a way that they can deliver glare-free illumination, thus being suitable for hospitals and other clinical settings. Moreover, the labor costs and the maintenance costs are also dramatically reduced, as opposed to systems that use fluorescent light bulbs, and the panels remain cool to the touch even when used for tens of hours in a row. This aspect is particularly important, because by preventing over-heating these panels remove the need for ventilation and they also reduce the risk of fire. LED panel lights can be embedded in the panels in four different ways: they can be mounted on it, recessed, suspended or built-in right at the manufacturing plant, the latter being the most common choice. The LED panel lights consume about a quarter of the regular amount of energy a fluorescent bulb-lit panel would consume, and it does not produce any ultraviolet radiation or infrared rays whatsoever. While fluorescent bulb burnouts are frequent and they require high maintenance (and they are very expensive as well), this does not apply to LED panel lights which are affordable and versatile. The panel will keep providing even light even when one or multiple LED bulbs are broken, it comes with a heat protection system and it starts instantly. Also, these panels come in different shapes: they can be rectangular, square and round, and each type is designed for a specific environment. Some panels can be used both indoors and outdoors, depending on their intended use and their construction. Customers can also choose the desired LED light color (the color can be white, cool white, warm, natural white, red, blue, green and such), as well as the desired wattage. LED bulbs usually have a wattage between 1W and 30W, although high-intensity LED panel lights are available as well. Additional features include dimmable lights, remote-controlled sensors, rechargeable lights (systems that rely on solar power to deliver light), and the most advanced panels can even come with a sound activation feature. 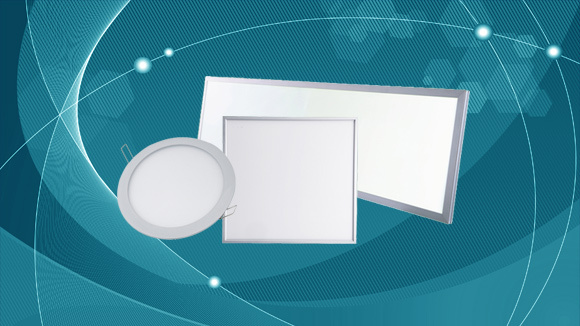 The bottom line is that unlike many illumination panels available on the market, the LED panel lights are especially designed to provide maximum heat dissipation, and they deliver high brightness and a constant luminous flux. Depending on the manufacturer and the area of application, the LED panels can also be vibration resistant and shock resistant, and they are always constructed without mercury therefore they are safe to use in the long run. The luminous efficacy of the LED lights can vary, but on average these bulbs have around 100 lumens per W.
Due to the lay-in fixture (the most commonly used type of fixture for this type of panels), the LED panel lights are commonly used in large business offices, nursing homes, clinics, hospitals and even schools. Generally speaking, the panels are intended for locations that require efficient, constant and affordable illumination.